Buying a home is a major decision. It’s one that can affect you and your family for years to come, so it deserves plenty of consideration. Not only will you be paying for your home for several years to come, but you’ll be living there. If you somehow miss the lack of storage space in the home before purchase, that could turn into a costly oversight. But, if you’re planning to go to a builder for new construction, it’s often not possible to poke through every closet and cabinet because they haven’t been built yet! Taking the time to go over every detail before you buy is especially important if you’re working with high-end luxury home builders. If you’re planning on building your next home, start with these important questions to ask home builders. What types of homes do you typically build? It may seem like a no-brainer, but it’s an important question to ask. If you’re looking for a high-end home with all the perfect details and above-standard finishes, you’ll want to search specifically for luxury home builders. Economy home builders will have the same structural knowledge, but won’t have the experience with the details that take a home to the luxury level. Do you have a project I can walk through? Pictures, blueprints, and architectural renderings are all well and good, but the three-dimensional experience of walking through a home can give you a better sense of the home. If you’re choosing a new build, you probably won’t be able to walk through your specific home, but most home builders will have at least a couple of projects going at once. Ask if they have a project with a similar floor plan available to walk through. You’ll get a sense of the flow from room to room as well as the dimensions. You’ll also be able to see a bit of that builder’s construction process. What does your warranty cover? What is excluded? It’s hard to think about things going wrong before the ground is even broken to start construction, but that’s exactly when you need to. Before you sign on the dotted line, ask potential builders what their warranty will cover. And, even more important, ask what the warranty does not cover. Don’t just assume something is covered because it seems like it should be a standard concern. Can I choose the subcontractors? This is your home, so it’s understandable that you want to have as much of a say in every level of the design and building process as possible. 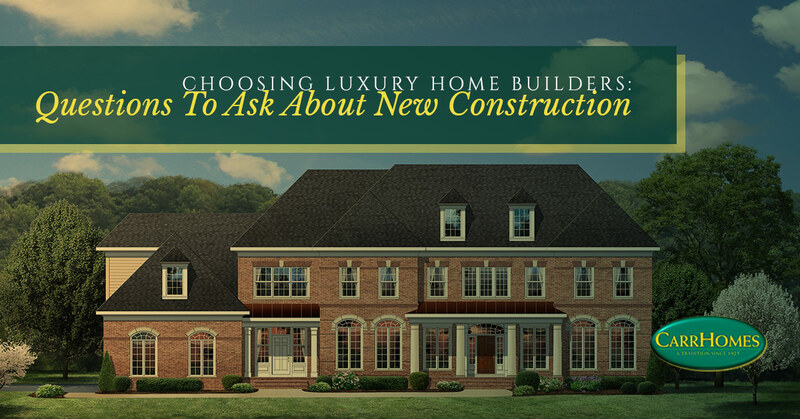 However, when it comes to subcontractors, many experienced luxury home builders will have cultivated a list of those they’ve worked with and had good experiences. Feel free to ask your builder to provide you with a list of their preferred subcontractors. With that list, you can do your own research and choose who you’d like to work with. However, a caveat here is that doing this can delay your building timeline if your chosen contractor is already working on other projects. Unless there are big warning flags for a certain contractor, it may be better to just let your builder choose who to hire. Which features are standard and which are upgrades? Model homes are designed to show off all of the best features a builder can provide. But, just because those features are available doesn’t mean they come standard. If you really have your heart set on a certain customization, you’ll want to know upfront whether there will be an additional charge for it or not. In addition, it’s also a good idea to ask how the builder will handle changes or upgrades if you decide to make a change part way through the building process. What happens if you don’t finish on time? Many people building a home also have to worry about timing their current home’s sale. And, if the build goes longer than anticipated, that could create problems when it’s time to move out of the old home. You don’t want your builder to rush through the last steps and leave you with shoddy construction in exchange for meeting the deadline. But it’s also good to know what they’re prepared to do if something has happened to delay construction. There are myriad other questions to ask and details to learn before you build. The CarrHomes team has been building luxury homes since 1925, so we’ve got a wealth of experience. Contact us for answers to all of your questions and get started building your home!